The Nike Running Shield Collection is back for a Holiday 2012 release. The all-conditions running shoes feature loads of technology to keep you on the track regardless of the weather. With DWR (Durable Water Repellent) material, each shoe has the tough outer layer capable of withstanding moisture to keep your runs dry. Each shoe is fitted with reflective materials aiding in nighttime excursions. 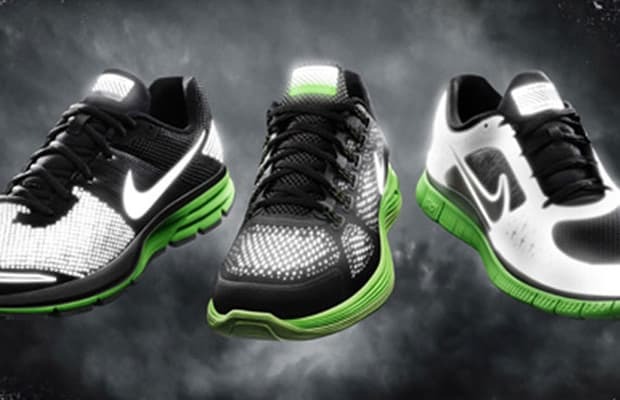 Four shoes get the Shield treatment: The Free Run 3, Air Pegasus 29, Lunarspeed Lite, and the Lunarglide 4 are all dressed black and green with all of the amenities that will assist your foul-weather runs.